Ivan Gene Crews was born to Medford and Maude (Hamilton) Crews on January 2, 1936, in Belle’s Creek, Mo. At the age of 83, Gene was reunited with his wife and daughter in heaven on January 31, 2019 at his home in Beulah. Preceding him in death were his loving wife, Leata Lauvell (Willbanks) Crews; daughter, Leata Kay Coker; father, Medford Crews; mother, Maude Crews; brothers, Willard Crews, Wills Crews, and Don Crews; sisters, Wilma Kemp and Mildred Louise Crews; sisters-in-law, Hazel Crews, Mildred Crews and Betty Crews; brother-in-law, Ray Kemp; nephews, Roland Crews, Terry Crews, Ronnie Crews, Doogie Crews and Roger Crews; and niece, Judy Forshey. Gene is survived by his son, Ivan Daniel Crews, and wife, Carla Sue; daughter, Teresa Ann Crews; grandchildren, Johnathun, and wife, Misty Sullins, Joshua, and wife, Andrea Sullins, Jarad Crews, and fiancé, Abby Casper, Leslie Crews, Diana, and her husband, Delmar Conner, and Devin Crews; nephews, Jerry, and wife, Nan Crews, Dannie, and wife, Linda Crews, Gary Crews, Darrell Crews, Kevin Kemp and Kelly Kemp; nieces, Debbie Grosenbacher, Phyllis, and husband, Bob Copeland, and Laura Pitts; and twelve very much-loved great grandchildren. 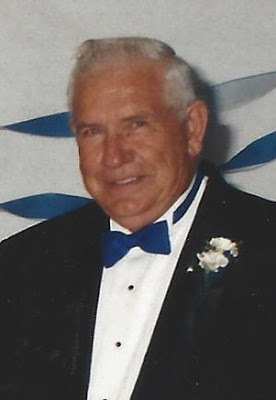 A visitation will be held on Monday, February 4, 2019 from 5:00-7:00 p.m. at Fox Funeral Home, 128 S. Main St, Licking. A funeral service for Mr. Crews will be held Tuesday, February 5, 2019 at 1:00 p.m. at Fox Funeral Home, with Pastor Paul Richardson officiating. Interment was at Beulah Cemetery. Pallbearers were Bobby Copeland, Mike Miller, Coy Willbanks and Troy Willbanks.